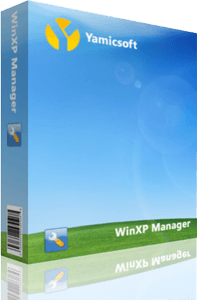 WinXP Manager is an all-in-one utility for Microsoft Windows XP specially, it includes over forty different utilities to optimize, tweak, clean up, speed up and repair your Windows XP, helps make your system perform faster, eliminate system fault, increase stability and security, personalize your copy of Windows XP, and meet all of your expectations. Gets detailed information about your system and hardware, helps you find out the Micrsoft product key such as Microsoft Windows and Microsoft Office; Shows and manages all running processes and threads; Repair Center helps to diagnose and fix the various system problems; Cleans up your system just one clicking; Optimization Wizard is useful to the user who is unfamiliar with computers. 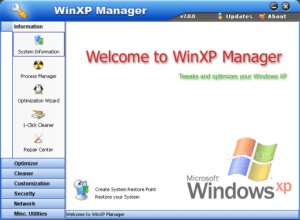 Tweaks your system to improve performance and increase speed; Manages and configures the Windows boot menu to your preference; Startup Manager controls all the started programs with Windows start, checks and repairs the advanced starup items to restore the malicious change by viruses; Manages and optimizes system services and drivers to improve performance. Disk Analyzer can analyze and view the disk space usage of all programs, files and folders find out which engross your disk space and shown with a chart; Smart Uninstaller can fully delete programs from your system without residual files and Registry entries; Searches and deletes junk files to save disk space and improve performance; Searches and deletes the duplicated files to save your disk space; Registry Cleaner searches Registry to find out and delete the invalid items; Registry Defrag rebuilds and re-indexes your Registry to reduce registry access time and therefore improve application responsiveness and eliminate mistakes and corruption in Registry. Customizes system parameters according to your preferences by tweaking File Explorer, Desktop, Start Menu, Taskbar and Notification area; Manages the context menu when right click the file, folder, etc; Customizes the look of your system; Edits and adds the shortcuts that executed on Run dialog box. Tweaks system, components, login settings, adjusts various settings and restricts access to drives and programs to improve system security; Safeguard your sensitive files and folders security, encrypt files, move system folders to safe locations; Privacy Protector ensures privacy and keeps sensitive information secure by eliminating tracks. Optimizes and tweaks your internet connection and network settings; Tweaks and Adjusts Internet Explorer; IP Switcher can switch between different network settings easily. Creates scheduled tasks or the monitorings that trigger tasks; Shows and run the useful collection of utility that built-in your Windows; Splits a file into several smaller files or merges back to the original file. Copyright © 2003-2019 Yamicsoft Ltd. All rights reserved.